The Aspen Mountain ski area, also known as “Ajax,” sits directly south of Aspen and is legendary for its double-diamond expert runs and the Silver Queen Gondola and Little Nell chairlift that take skiers onto the mountains right out of downtown Aspen. The ski area covers Aspen Mountain and Bell Mountain, rising to an altitude of 11,212 feet from a base of 7,945 feet. It classifies 26 percent of its runs as expert, 26 percent as most difficult, and 48 percent as more difficult. There are no easy runs. The ski area has operated since 1946, when the Aspen Skiing Corp. opened Lift-1, then the world’s longest chairlift. Before that, there was a crude boat tow on the mountain, and some early skiers would hike up the mountain from Aspen and ski down. Today, Aspen Mountain has 76 trails covering 65 miles, served by the gondola and seven chairlifts with a capacity of 10,755 riders per hour. 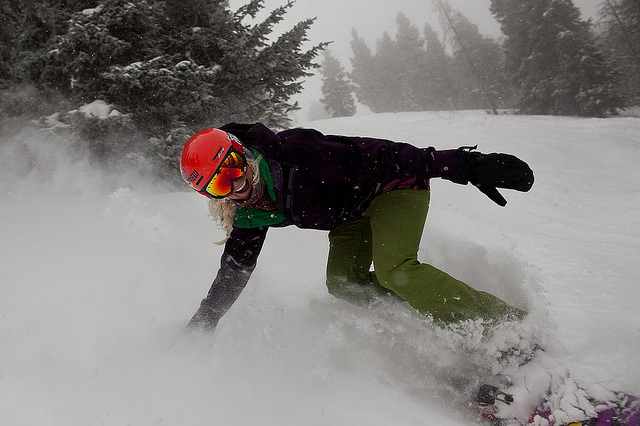 The 673 acres of skiable terrain at Aspen Mountain is small by ski resort standards, giving the area an intimate feel. The ski area averages 300 inches of snow, with a ski season that begins at Thanksgiving and runs into early April. It has snowmaking capability on 210 acres. The gondola also is open in the summer. Experts looking for double black diamond runs should head from the top of the gondola to Walsh’s, Hyrup’s, and Kristi. A series of expert runs, called the Glades, drop off Gentleman’s Ridge. On the opposite side of the ski area, off the Ruthie’s and F.I.S. chairlifts, are a series of other double-black runs known collectively as “The Dumps” because mining waste was dumped there during the silver boom. There is some gated terrain – Trainor’s, Rayborn’s, Bingo Glades, and Cose Dumps are wild, ungroomed runs that open up when there is heavy snowfall. The steepest run is the Elevator Shaft section of the Silver Queen run, with a slope of 42 degrees. Aspen Mountain does not offer a terrain park, but snowboarders have been welcome on its runs since 2002. The ski area does have four restaurants, including the famed Sundeck at the top of the gondola with views of Castle Peak (14,267 feet) and Hayden Peak (13,561 feet). Aspen Mountain also has a string of homemade memorials along the slopes that honor a variety of celebrities, from singers John Denver, Jerry Garcia, and Elvis Presley to actress Marilyn Monroe and cartoon character Snoopy.